Anthony Lee , son of Fanny Lee , was born in 1835 in Heavitree Workhouse, Exeter, was christened on 12 Jun 1835 in Exeter St Sidwell,and died in 1907 in Exeter St Thomas, Devon at age 72. Anthony married Mary Nichols , daughter of William Nichols and Mary, on 9 Feb 1860 in Christow. Mary was born in 1834 in South Tawton. Anthony was born in the workhouse at Heavitree in Exeter. His mother was Fanny Lee and he spent his childhood in the workhouse, so it is possible she died as there is a death recorded for a Fanny Lee in Exeter in 1839. In 1841 he is recorded as a pauper aged 9, living in Exeter Workhouse in St Sidwell, Exeter. This must have been why he had illusions of being born from aristocracy as when his son Harry married on his marriage certificate for father's name he put Anthony Farthingale Lee . On his marriage to Mary he put down his father as Anthony Lee. Conditions in the workhouse would have been very stark. The date of Anthony's birth is significant because one of the most controversial parts of the 1934 Poor Law Act was the ' The Bastardy Clause ' which made all illegitimate children the sole responsibility of their mothers until they were 16 years old. If mothers of such children were unable to support themselves and their offspring, they would have to enter the workhouse; the putative father became free of any legal responsibility for his illegitimate offspring. Not only did this remove the not infrequent problem of disputed fatherhood, but it was envisaged that the measure would discourage women from entering into profligate relationships. Perhaps unsurprisingly, this was a highly contentious measure and was overturned in a subsequent Act in 1844 which enabled an unmarried mother to apply for an affiliation order against the father for maintenance of the mother and child, regardless of whether she was in receipt of poor relief, however this was too late for Fanny. However also under the 1834 Act, Poor Law Unions were required to provide at least three hours a day of schooling for workhouse children, and to appoint a schoolmaster and/or schoolmistress. The children were taught " reading, writing, arithmetic , and the principles of the Christian Religion, and such other instruction as may fit them for service, and train them to habits of usefulness, industry and virtue". 6.00-7.00 Rise, make beds, prayers, clean shoes and wash.
7.00-7.45 Gymnastics exercises (Saturdays excepted) . 9.00-10.00 Historical reading, with explanations. 11.00-12.00 Grammar. Parsing and Dictation. 2.00-3.00 Writing in copy books & arithmetic. 8.00 Prayers. retire to bed. This act meant that Anthony was probably better educated than many children outside of the workhouse who hardly ever attended school because they were helping their parents either on the land or in the house. In fact before this act he would have been apprenticed out at the age of seven to some farmer until he was twenty one. This is a sample of the diet he would have received at Exeter Workhouse. It might seem strange children were given beer but at this time there was no purified water to drink. Breakfast:- Three ounces of bread and one ounce of cheese, half a pint of "Beere". Dinner:- Eight ounces of beefe, four ounces bread, one pint of Beere, and Garden stuff sufficient. Supper:- Four ounces bread, one and a half ounces of cheese or one ounce of butter,and half a pint of beere. In 1851 Anthony was working as a labourer in Christow for James Hamlyn at Lower Bennah and in 1861 he was living with Mary at Naydon Cottage in Bridford, Devon. Living with them was son George aged 1 and John Nichols , Mary's son aged 4, born in South Tawton. By 1871 he had moved to Christow and was living in Teign Terrace, Christow with children, Alice aged 9, Albert aged 7, Charley 5, Henry 2 and Caroline aged 7 months, also lodgers, William Caseley and William Hole and in 1881 he was still living in Teign Terrace with children, Charles aged 15, born Doddiscombsleigh, Caroline (Carrie) aged 11 born Christow and Alice M aged 8 born Christow. In 1891 Anthony was still living in Teign Terrace, Christow with a lodger William Caseley , next door was wife Mary living with her elderly mother and next door again was their son Harry Lee . As there were only three rooms in each cottage, maybe they felt they needed to spread out now the children had left home. By 1901 Anthony had been admitted back to the workhouse in Exeter where he probably died. So he ended his days where he was born. In 1882 the Teign Valley railway link joined Moretonhampstead to Christow. George Lee born in 1860 in Bridford, Devon. George married Wilmot. Ellen Lee born in 1862 in Christow, Devon. Albert Lee born in 1864 in Holcombe Burnell, Devon. Charles Lee born in 1866 in Doddiscomsleigh, Devon. The Lee family entwined with the Yeo family massively at this point. Two Yeo brothers, John and Henry married two Lee sisters, Carrie and Alice. 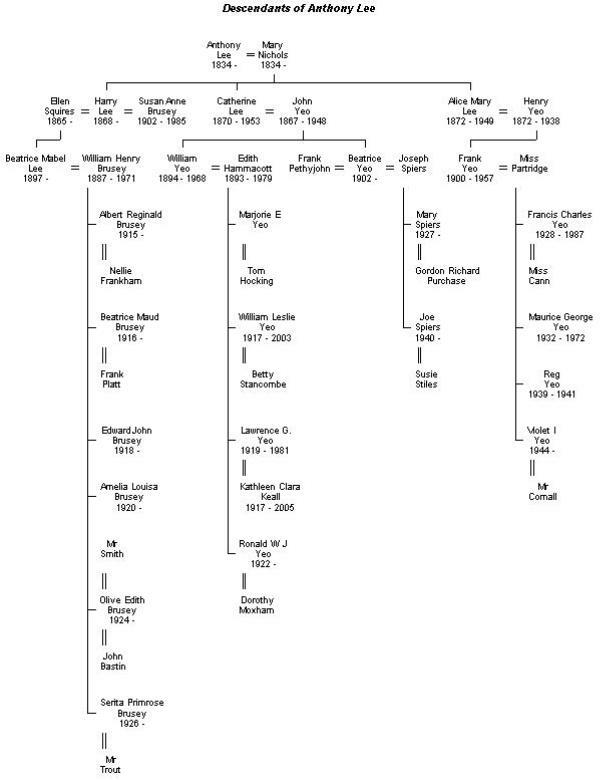 Their brother Harry Lee 's daughter, Beatrice married William Henry Brusey who was a second cousin of John & Henry Yeo and then Harry married William Henry's sister Susan Anne Brusey . So the Yeos, Lees and Bruseys were all related. Harry Lee was born in 1868 in Christow. Harry married Ellen Squires in 1889 in Exeter St Thomas area. Devon. Ellen was born in 1865 in Wolverhampton, Staffordshire. Harry next married Susan Anne Brusey , daughter of John Brusey and Susan Dyer , on 17 Jul 1926 in Stokeinteignhead,. Susan was born on 25 Jun 1902 in Netherton, Haccombe with Combe, and died on 20 Feb 1985 in Torbay Hospital, Devon at age 82. In 1881 Harry was an indoor farm servant aged 13, living in with farmer, Nicholas Adams at Hill Farm, Christow, Devon. In 1891 he was an agricultural labourer, living next door to his mother in Teign Terrace, Christow. By 1901 he had married Ellen and was living at Hollamoor, Dunsford, with children, William aged 10, Wilfred aged 6 and Beatrice aged 4. Harry worked as an agricultural labourer and was a great old gent. When Harry married in Stokeinteignhead he recorded his father's name as Anthony Farthingale Lee . Anthony was illegitimate and the story has always been that there was wealth in the family. Perhaps the Farthingale is a clue.!!. Bob Rubie remember him in his later years lying in bed at his Auntie's house in Church House Lane, Stoke, by this time he was blind, but always knew Bob and his sister, when they arrived for their annual summer holidays. Harry had been the Church sexton at Stoke for many years and used to take Bob to the Church House Inn in Stokeingteignhead where they would meet Lou Dyer , a relative. Harry's second wife, Susan nee Brusey was the sister of Bob's mother, Violet and their mother was Susan Dyer . Susan's grandmother was Susanna Yeo , sister to John born 1843 who married Elizabeth Crout . Susan left Combe school on the 4th August 1916 aged 14 years and went into service. She married Harry who was 34 years older than her, in 1926 and they never had children together. We Messrs Tozer Edwards & McMurtrie of Teignmouth in the County of Devon Solicitors, Agents for Queen Anne's bounty, 3 , Dean's Yard, Westminster, London S.W.1. give notice that we apply for an Order for the recovery of the sum of one shilling and eight pence, due in respect of the tithe rent charge issuing out of the lands described in the Schedule to this application for the period of one and a half years and which became payable on the first day of October 1933. The owner of the said lands is Mrs H. Lee of Gabwell Cross, Stokeinteignhead, Newton Abbot. The owner is the sole occupier of the lands. We shall apply that the Order for recovery be executed by the appointment of an officer to distrain under Sub-section 2 of Section 2 of the Act. Cottage & Orchard Stokeinteignhead Devon 609. However they continued to live in Stokeingteignhead and are both buried in the churchyard there. William Albert Lee born 1889 in Christow, Devon and was christened on 5 Aug 1889 in Christow. Wilfred Lee born on 19 th March, 1890 in Christow and died on 25 Mar 1966 in Stokeinteignhead, Devon at age 71, and was buried in Stokeinteignhead Churchyard. He married Louisa Emily (b. 1903, d. 16 Jan, 1982). The child from this marriage was Ronald W Lee who married Betty . Edith Lee born on 19 Apr 1906 in Stokeinteignhead, Devon, died on 26 Dec 1991 in Kingskerswell, Devon at age 85, and was buried in Denbury Churchyard, Devon. Edith married Harry George Monk . Harry was born in 1900, died on 29 Mar 1958 at age 58, and was buried in Denbury Churchyard, Devon. My thanks to Bob Rubie for most of the information on the Lee family and the photograph of Harry Lee.